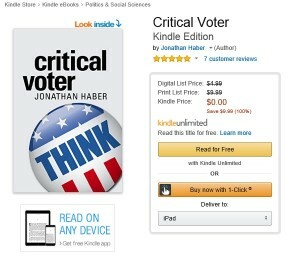 From today until July 19th, the Kindle version of Critical Voter will be available for free from Amazon. Tell your friends, your relatives, your colleagues and co-workers that the tool they need to get something out of this year’s election madness is available to them for a single click. Tell your adversaries, your opponents and debate partners that if they want to give you a tough (and honest) argument, they can learn how for just the cost of turning (and reading) the pages of Critical Voter. Fre-ebook Tuesday will continue for the next five weeks until July 19th.